An update on the Cathedral Place Revitalization Project was presented by project manager, Terry Charters. The presentation began with a review of the history of the project to date, and then described a lengthy due diligence period to confirm that the revitalization would be financially viable and would meet the goals of both development partners (the Diocese and Windmill Developments). Concept drawings were shown for the proposed buildings, which presently include a midrise residential condo building and a new administration building that would also house the daycare. The historically designated aspects of the cathedral building itself and the original schoolhouse portion of our current administration building will remain intact throughout the redevelopment. Terry also provided a summary of the various consultant reports that have been commissioned to provide the needed information to advance the plan. At present, a market study and a cost estimate are being finalized. When received, these two documents will complete the package of reports that will be used for the final evaluation with a triple bottom line approach, the requirements are consistent with our diocesan vision to ensure social, environmental and financial benefits. They hope to be in a position by May 2017 to sign the agreements and formally commit to the revitalization plan. 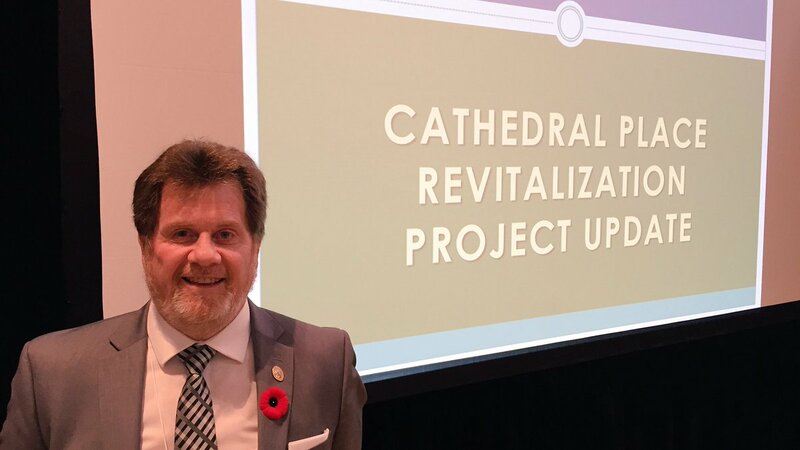 Terry Charters, appointed by Bishop Michael in December 2015 as volunteer Project Manager for the Cathedral Revitalization project, has an extensive background in project and construction management.